My boys love Chef Boyardee as an after school snack. They are growing boys, so they have big appetites! I loved this stuff growing up. It was such the staple! What a great rollback, I rarely get over to Wal-Mart locally but should seeing that this deal is there. Great way to save some cash and stock up! 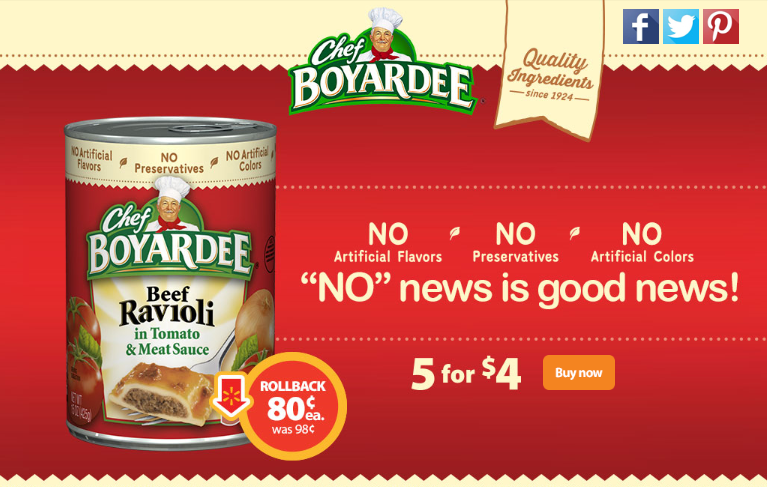 There was a rime when I always had a can or two of Chef Boyardee in my pantry-usually the Mini Ravioli. I used to eat it as a quick lunch. I really have to try and remember to pick some up next time I go shopping. I always liked Beefaroni, so I ought to pick some up while it's on sale. It's a childhood fave! I can't believe I haven't given my kids Befferoni yet! It was my fave growing up! Chef Boyardee is one of my childhood favorites. My boys have also loved it since they were little and would often ask for it for lunch.